Nicknamed the Bear Flag, the State Flag of California was designed by William Todd, nephew of the wife of Abraham Lincoln. 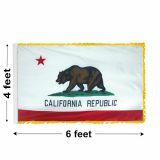 It was raised in 1846 by American settlers in revolt against Mexican rule and was officially adopted as the state flag of California in 1911. The flag features the state animal of California, the grizzly bear, and a lone star on a white background. Tuff Flags has a complete line of American-Made, Commercial Grade California Flags suited for Municipalities and Businesses in a variety of sizes and material choices including 200 denier nylon and the heavy duty 2-ply polyester to fit your location and weather. We have flags for both indoor and outdoor use as well as complete indoor flag sets to polish any official presentation space. Manufactured with Dupont Inks and Fabric on industrial printers and reinforced well beyond market standards. 100% Customer Satisfaction Guaranteed! We Accept Government and Corporate Purchase Orders, Credit Cards, Paypal, and Checks. 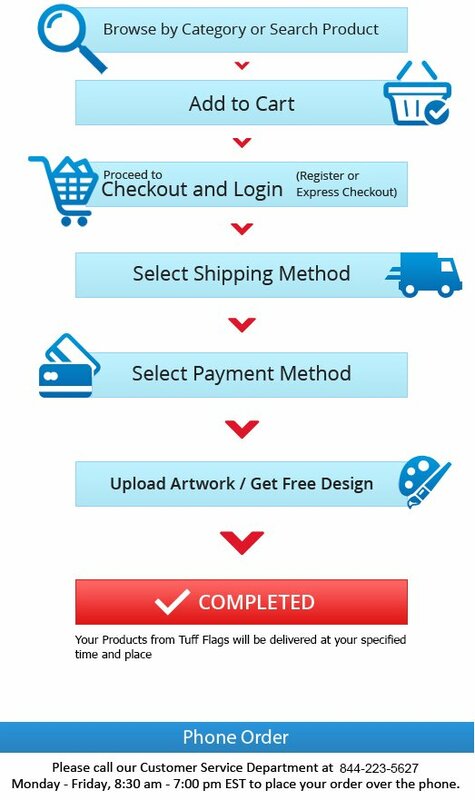 Stock Products ship within 24 hours! 100% made in the USA, our California flags are printed with California's official design. Our flags not only last but you'll be proud of the quality of flag representing your city, county, school or office. 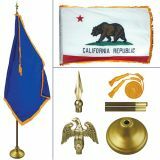 If you are looking for a strong CA flag that will fly even in the slightest wind, browse our nylon flags made of 200 denier nylon and finished with headings and grommets. If you need a heavy duty flag that can withstand heavy wind more effectively, polyester flags are a better choice. Offered immediately in a large range of sizes: 3’x5’, 4’x6’, 5’x8’ 6’x10’, and 8’x12’. Our complete line of California flags will ensure that you have the perfect for your location and use! Browse our collection California Flags and choose the style flags that match your needs. Find it overwhelming? 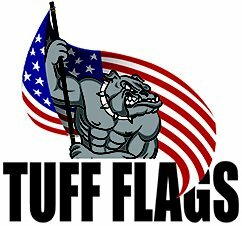 Chat with us on Live Chat, call us at our toll free number (888) 287-3524 or email us at customercare@tuffflags.com.